They will be updating the 2019 conference website afstws2019.org as more information becomes available. However, the official website launch will be May 1, 2019.
will be held in Kuala Lumpur, Malaysia from 21-25 July 2019. Through support from The Summerlee Foundation, the Wild Felid Research and Management Association was given the opportunity to award grants to well-deserving projects on wild felids in Latin American countries. Five recipients and their projects were selected for the 2015 grant and each was awarded $5,000. Information on their projects can be found in The Wild Felid Monitor, V9(I2) and V10(I1). We hope to offer the grant again in the future. May 15 – 18, 2017 in Estes Park, Colorado. 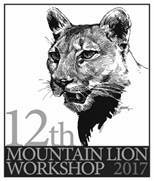 Proceedings of the 10th Mountain Lion Workshop CLICK HERE.